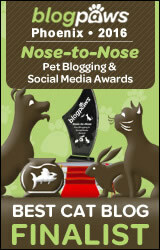 Recently I won the PetSafe Flitter automatic cat toy from my friends Truffle and Brulee! I couldn’t wait to try it out. 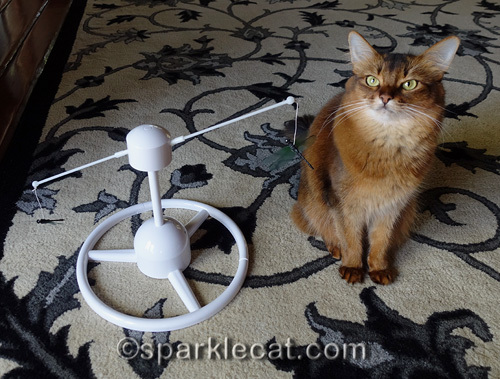 It arrived on Wednesday… and my human even had batteries for it! Of course I had to supervise as it was put together. And give it a taste test! If you are wondering what Binga thought, there is a video of her with it too. That snorting noise you hear in the background is my human trying to stifle her laughter. Boodie looked at it for a few moments, but she wasn’t interested in the least, so no video of her. My human turned it on a couple more times — it turns off automatically after about 10 minutes — but there were no takers. I wanted to play with my sparkle ball. 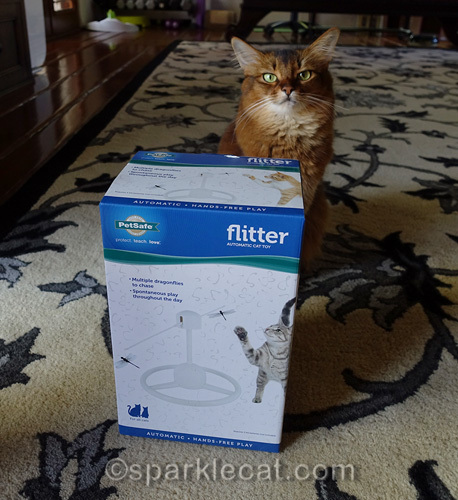 If you think you might enjoy it more than we did, you can get the PetSafe Flitter on Amazon. Unless we take more of an interest in ours, it is going to be donated to Kitten Rescue for their kitten room, where it will probably be way more appreciated. Disclosure: the Amazon link to the PetSafe Flitter is an affiliate link, so I will get a small commission if you click on the link and buy it. Maybe you will like it more after you have had it for a bit. Cats can be so fickle! We laughed at Binga trying to not see it…then sniffing the motor part…it reminded meowmy of when our furbear Suki would try to figure out how the littermaid motorized rake worked, MOL! It does look like fun, though. Minko would be the most intrigue with it we think…he would try to eat the strings holding the dragonflies, MOL! Truffle tends to play with it more than Brulee. Brulee usually sits and looks at it. Every once in a while, both of them go crazy over it. Who can predict what cats will do? Oh, Binga! You look pretty unimpressed. When we were playing with ours, Pierre yanked it across the floor and scared Newton, and Newton refused to come near it until it turned off because he was afraid it would chase him. I’m glad you cats are brave around this kind of toy. My dog might run from it. Doesn’t look much fun to me. We are following you on You Tube now!!!!! Ummmmm, that is expected to entertain a cat for a long time. Well, at least the video entertained the peoples. As always, Binga just cracks me up–oh, look at this thing oh it hit me in the face I wonder what it does damn now it got me in the chin. Oh well, later. I think she’s gonna nope right outta there! MOL! PS Mum says try the Vee iPhone app. Its fun, cheap and easy to use (you press the screen to ‘shoot’ footage) it does slo-mo, and fun filters and *whispers* She can use it to it must be easy!! You can never tell with toys lime this. Mum thought we would hate the yellow moving one (the round one with a wand underneath) but Silver loves it and Sienna pounces on it., it is a source of great entertainment! I didn’t hear your human cos Pop was laughing too hard. After watching it, I don’t think I’d care for it and TW would be afraid it would blind me or something. I think it needs a laser or something. We seem to watch our Flitter more than play with it too, Summer. Aw, I’m sorry you didn’t enjoy it more! After it chucked Binga under the chin, I was expecting her to just haul off and smack the snot out of it. Great videos, but I guess my cats are having just as much fun with the June bugs, and soon there will be LOCUSTS ! Love Binga’s non-reaction!!! 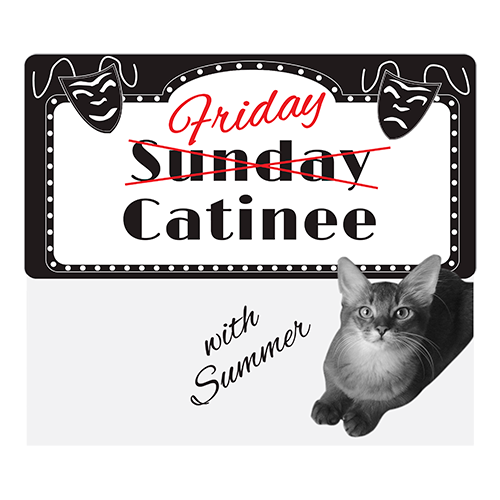 The kittens would love it – but we would be bored with it, too! MOL! Me and my mum were laughing at Binga too. I don’t think it would interest me very much though. I agree pretty Summer, the video was more fun than the toy! Binga, that evil thing kept smacking you! Our mommy found it very funny but we felt really bad for you. What is with these humans laughing at that. Sheesh. How Cute! It’s always nice to try new stuff. 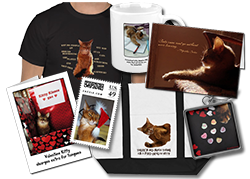 Mom is a bit wary of getting us stuff though, because we usually …. don’t play with it. Pretty Cats will always be Pretty Cats! Cats look so pretty when they are playing, especially what they do with their PAWS! Good girl Binga for getting on the video. I don’t think it would hold our interest very long either. I gotta say, it doesn’t look like much fun at all…but I enjoyed the heck out of the videos anyway. Looks like a fun toy although I don’t think Binga knows what to think about it. We’re not sure we would like it either. Binga was funny! Have a great weekend! 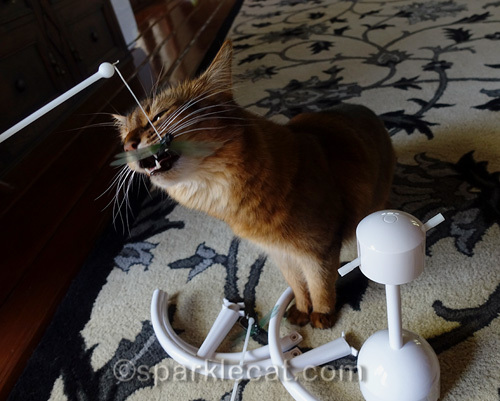 We had to smile at Binga playing with the toy Summer but we don’t think it’s something we would want to play with. That looks interesting. We’re not sure what we would think.